Give this to the next Buffy fan to approach you for a suggestion, for serious. Maggie Quinn has always been somewhat intuitive. Her gran tells her that the Sight runs in the family. 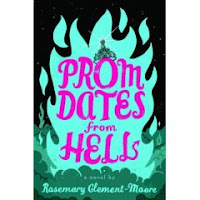 So when Maggie starts having horrific dreams about fire and brimstone and a shadowy demon, she's not completely surprised to find mysterious things happening at her high school. The first appearance is at the pool during gym class. Maggie notices a strange sulfuric odor and then her classmate Karen "accidentally" slips on the high dive, cracking her head on the board on her way down. Maggie knows that it's no accident and she sets out to get her Nancy Drew on. Luckily, she has a dreamy sidekick: an anthropology student in one of her father's classes at the university. Together, they'll have to figured out who summoned this demon, who's on the demon's hit list, and what they can do to stop it... Worst of all, Maggie might have to face her worst fear... going to the prom. "Professor Blackthorne was holding his own with one of the beasts, standing over it with a chair leg and splattering it apart every time it re-formed. 'You will not' -splat- 'defy' -squish- 'the laws' -scrunch- 'of nature.'" Tell me that doesn't bring back recollections of the principal from Buffy the movie standing over slain students and passing out detention slips. Hand this one to fans of Devilish, the Mediator series, and maybe Tattoo.